Do you own a deaf dog? Have you ever had the opportunity to work with a deaf dog? I had not—until Blanca. In 2013, my friend Milena rescued a large, but skeletal, dog from an abandoned gas station and contacted me for some training help. The dog delivered 10 puppies the day after her rescue, and was big, strong, and exuberant. I agreed to help evaluate and do some training with the mom, as well as assist with puppy duty. Although I had fostered, adopted, and cared for hundreds of dogs, I had yet to meet a deaf dog in my personal or professional life. With her all-white coat, the dog was named Blanca (meaning “white” in Spanish). Blanca responded eagerly to attention and appeared motivated to figure out how to earn small pieces of hotdog. Always armed with my treat pouch and clicker, I was ready to mark (with a click) and reinforce (with hotdog or something of equally high value) behavior that I liked. I ignored Blanca’s jumping and reinforced with a click and then some cheese for her sit. We moved around and repeated the behavior. My friend watched these first lessons, and then mentioned that she thought the dog might have trouble hearing. Was Blanca just responding to my body language? Milena became aware of a potential hearing problem in the early morning when she could come right up to Blanca without the dog stirring. Blanca also seemed to ignore the hungry cries of her puppies. We noted that when other dogs barked, or car horns honked, Blanca was seemingly unaware. It was a few visits later that we determined, after various sound tests, that Blanca was deaf. Never having worked with a deaf dog before, I started to do some research on deafness in dogs. I was surprised to learn that in the past, and, sadly, perhaps even now, deafness would be a reason to put a dog to sleep. As I watched this intelligent and loving dog learn, I was shocked to think that her lack of hearing could have meant instant euthanasia. While Blanca’s deafness was a training challenge and required some modifications, I believe that her other senses (smell, peripheral vision, body language) may actually be enhanced, as often happens when humans are deaf. Although all dogs are acutely aware of body language, deaf dogs are even more keenly observant of body language and gestures. This is certainly true in Blanca’s case. While training relies on verbal (often not entirely effectual) communication quite frequently, that method obviously does not suffice for a deaf dog. Deaf dogs require families to focus on training in a different way; a way that can certainly be used with all dogs, but is essential for those with hearing loss. But, how do you begin to work with a deaf dog when the default or “go to” form of communication is verbal? What is most important is to be careful and deliberate with hand, face, and body movements. Owners and trainers “speak” to dogs, teaching them to comprehend intent and meaning. With a deaf dog, the verbal avenue is not an option. Communication needs to focus on the visual sense instead. What is most important is to be careful and deliberate with hand, face, and body movements. Even with this change in emphasis from verbal to visual, if you have trained an animal with an auditory or verbal marker, the shift in training is not all that significant once you get the hang of it! In Blanca’s case, and with other deaf dogs I have trained, I used a “hand flash” as the visual marker. A hand flash is where all fingers start together in a fist, then the fist releases to an open palm hand with all fingers out straight, followed by a return to the original fisted position. Others choose to use a “thumbs up” gesture for a visual marker. As with any marker, we pair the marker with a reinforcer consistently so that it becomes a conditioned reinforcer. Step one was teaching Blanca that this hand flash meant good things! Just as a trainer may choose to “load the clicker” a few times in order to create the association that the marker equals something reinforcing, I followed the same process with the visual marker. To start, a hand flash was immediately followed by a treat delivered with the other hand. This pattern was repeated a series of times until I was sure that Blanca realized that the hand flash communicated that she had earned access to something that she found reinforcing. With a deaf dog, one of most helpful behaviors, and one to work on first, is to mark and reinforce heavily for eye contact. The next step was to watch for something that Blanca did that I liked. For example, when she sat, I would mark that behavior with a visual hand flash marker and then reinforce the behavior. During this stage of training, I was grateful that I had attended Terry Ryan’s chicken camp! Trainers will often work with chickens to improve the speed and precise delivery of reinforcers (among other skills), which helps in training other animals. I needed to be quick to catch Blanca looking at me in order to give my visual marker, and then reinforce it. With a deaf dog, one of most helpful behaviors, and one to work on first, is to mark and reinforce heavily for eye contact. Fostering a “check-in” behavior is essential. Getting a deaf dog’s attention is another consideration, as it is not possible to call out to your pup. Fostering a “check-in” behavior is essential. Each and every time that your dog looks at you, you should mark and reinforce this behavior. Sometimes you can get your deaf dog’s attention via vibrations. Tapping or stomping on the floor may make create a vibration large enough to attract your dog’s attention. Once your dog looks at you, mark and reinforce that attention. In addition, waving hands or arms at a distance can gain your dog’s interest. Again, once your dog looks in your direction, mark and reinforce that attention. Another option, if it’s dark or at dusk, is to flick the lights off and on to draw your dog’s focus back to you. Some people use a small flashlight, but remember never to shine the light directly into the dog’s eyes. It is not advisable to use a laser pointer. Use the flashlight like a “clicker” or a special signal and turn it on/off quickly to mark a behavior. Remember that every time you mark you will want to follow up with something that your dog finds reinforcing. The marker is like a “promise” of access earned to something reinforcing, so be sure to keep your promise by providing that access after each marker. Another helpful behavior to train with a deaf dog is a shoulder tap that means “look at me.” Tap your dog on the shoulder and then pop something yummy (just a tiny piece) in his mouth. Repeat this pattern often, and in every room of your home, and then begin to practice outside as well. Your dog will come to understand that the tap equals good things for him, and he will begin to turn back to you anticipating the yummy treat. Continue to practice and “pay” for your dog turning to look at you. Eventually, after many, many, many repetitions, you may be able to replace your food reinforcer with attention and affection. In order to keep the behavior strong once it has been established (once you can rely on your dog turning to look at you when you tap him on the shoulder), continue to surprise your dog from time to time with something delicious as a reward. When you start to train the shoulder tap, be mindful that deaf dogs often startle. As a deaf dog cannot hear an approach, and sometimes cannot feel vibrations of someone nearby, the dog may startle when you appear suddenly. Work on associating people’s approach with positive things. You may have to hold a tiny bit of a yummy food each time you get near your deaf dog. Moving from room to room around your house let your deaf dog know that you have gone. Walking directly past the dog or offering a light touch on your way out may help your dog feel less anxious since he has seen you go. Your dog may choose to follow you or stay put; however, the anxiety of not knowing what happened to you has been eliminated. The next step in training a deaf dog is to build more visual cues for communication. Some people choose to use American Sign Language (ASL) signs and/or single-hand adaptations of the ASL signs. You can also make up your own signals as long as they are distinct and consistent. One time, Blanca and I were at a dog-health day doing a presentation on training. A woman and her husband approached us afterward. Via the husband’s translation, the woman, who was deaf herself, asked if I was using sign language to speak to my dog. I explained that Blanca was deaf and responded to signs. The woman asked if she could try one of Blanca’s cues, and then proceeded so sign “sit” using ASL. Blanca sat and the woman teared up. She exclaimed that this was the first time that she had ever been able to communicate with a dog! Another vital part of communicating with a deaf dog is teaching a recall. I always advocate in favor of safety first, so I recommend working on longer-distance recalls in fenced areas or with a long leash. However, as with any behavior, you will want to start training in close proximity and in a low-distraction environment. Move away, at first just an inch at a time, and then signal with a visual cue for your dog to come to you. Mark movement toward you and be sure to reinforce as the pup arrives where you are. As with any recall, slowly build distance and eventually build in distractions. Sometimes an owner feels as though the animal understands what is being communicated, but simply chooses not to respond as desired. At other times, the human is frustrated with his/her difficulties communicating the desired outcome to the dog. These are common frustrations training ANY dog, or ANY animal. However, with a deaf dog these feelings of exasperation may be intensified. Try to remember that even if you believe you have broken down the task into very small, manageable pieces and are communicating very clearly and efficiently, you are, in fact, communicating with a different species. Imagine for a moment that you are training your dog to place a red toy on top of a blue one. Continue to pretend that after your dog has (seemingly) mastered the behavior, she performs that behavior correctly 100% of the time for two weeks straight. Then, one day, your dog places the blue toy on top of the red one. The issue is not stubbornness, nor defiance, but rather a problem of communication. Your dog may have thought all along that the correct behavior was to stack up the two toys. She may have stacked red on blue for two weeks coincidentally, thus leading you to believe that your training was clear. In fact, there was a lack of clarity in the communication and training. Because humans are verbally oriented in our information exchanges, communicating in different ways with a deaf dog may be a struggle at first. Any time that you feel overwhelmed, stop and take a break. Revert back to something very simple, like making eye contact and marking and reinforcing this successful behavior. Celebrate tiny accomplishments; remember that this is a marathon and not a sprint. Your communication and training with your deaf dog, as with hearing dogs, will be a lifelong endeavor. 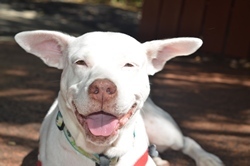 Deaf dogs can make great ambassadors for positive reinforcement training. 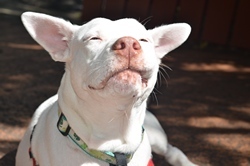 Deaf dogs can make great ambassadors for positive reinforcement training. Frequently, Blanca and I offer demonstrations on training and humane education at school and community events. Blanca demonstrates quite easily that there is no need to shout the word “no” repeatedly, or use other harsh verbal “corrections.” In fact, the word, and in the case of deaf dogs the signal or sign, for “no” is not something that I suggest you teach during your valuable training time. Telling an animal “no” does not provide much information. “No” is not a very clear communication tool, as it leaves the situation rather nebulous: “No what?” In its place, I strongly recommend working on incompatible behaviors and impulse-control training. In that way, you can offer your dog the choice to make good decisions about what you DO want the dog to do! Learning is not an upward and linear journey; it is a journey prone to setbacks and confusion. To achieve success with your deaf dog, maintain a positive attitude, take pride in small milestones, and acknowledge that your relationship is becoming stronger. Deaf dogs can teach a great amount about care, compassion, and novel training methods. Blanca is joyful and eager to learn and respond now that someone has taken time to figure out how to communicate with her! Terrie Hayward holds a master's degree in bilingual special education. She is a KPA faculty member, a KPA CTP, and a Certified Professional Dog Trainer through the Council of Professional Dog Trainers. Additionally, Terrie is certified as a Canine Separation Anxiety Trainer (CSAT) and is an Associate Member of the International Association of Animal Behavior Consultants (IAABC). A member of the Pet Professional Guild, Terrie has authored articles on training for BARKS magazine, Pet Business, and Grooming Business magazine, and is the author of the pocket guide to working with deaf dogs, A Deaf Dog Joins the Family.